We kicked off the conference on Wednesday, January 23 with a full day of meetings and the roundtable series, which included topics such as research priorities for the wastewater sector and tips for being a productive Board. 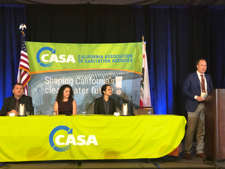 Thursday, January 24 we enjoyed keynote speaker Farah Habad, a panel of young professionals, discussed asset management for the future, and learned how artificial intelligence and analytics will be used in the wastewater community. Friday, January 25 we received federal and state legislative updates and learned more about what we can expect in the 2019 legislative session. In addition to the exciting speakers and panels, we hosted several successful networking events and receptions.